I will be listing a large quantity of toys over the next few weeks. Check out my other auctions for many more 1950's - 1960's Japan boxed battery operated, wind-up, and friction toys. 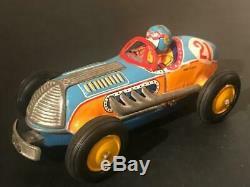 Very scarce 6 long 1950's Japan tin friction race car toy (this has no box, but it was labeled as the'SMASH-EM UP RACE CAR'). This toy has very colorful lithography. It is of all tin construction with rubber tires. It features a nice tin windscreen, molded tin side exhaust, and detailed driver's head at the wheel. The friction still works great and when the front bumper strikes an object, the hood pops apart! The toy is marked MADE IN JAPAN on the side. The litho is still super clean and glossy with almost no wear. The chrome plated parts have tarnished some with age. Nice scarce car in fine condition. Get images that make Supersized seem small. The item "Scarce 1950's Japan Tin Friction Toy Break-Apart Hood Crash Race Car with Driver" is in sale since Friday, March 22, 2019. This item is in the category "Toys & Hobbies\Vintage & Antique Toys\Tin\Vehicles". The seller is "treasuresof-yesterday" and is located in Webster, New York. This item can be shipped worldwide.